Nature’s a good teacher. One of the best. My wife and I have been hiking for probably 30 years and Nature still has a few lessons up her sleeves for us. Nature was kind enough to remind me of 5 great rules of adventuring and hiking with kids the last two weekends. The first weekend was pretty much a disaster. The second weekend was absolutely amazing. Here’s why. LESSON #1: DON’T WING HIKING WITH KIDS. MAP IT FIRST. A hiker confirmed the trailhead sign was a liar when we got about two miles in and there was no lake in sight. She said the lake was more like five miles one-way, or ten miles round trip. I didn’t think to map the trail beforehand for two reasons: 1) I’d heard the hike was “pretty easy and not too long” from someone I trusted. Famous last words, right? 2) My daughter’s getting to be a pretty strong hiker and I figured we’d just go as far as we could and turn around if the hike proved too challenging. As idyllic as it may be to think your kid will naturally develop an undying love of the outdoors that will keep them focused on the adventure at hand…it’s probably not going to happen. Kids need another layer of entertainment on top of your outdoor adventure. We accomplished this two ways. One was bringing the book Rocky Mountain Flora written by the esteemed Colorado Mountain Club. It’s a compendium of just about every plant and flower found in the Rocky Mountain region–a legitimate scientific identification book, but so easy to use that my daughter can pretty accurately identify plants with it on her own. The great thing is, she has fun using the book. The other layer of entertainment we added to our hike was to forage for wild huckleberries. 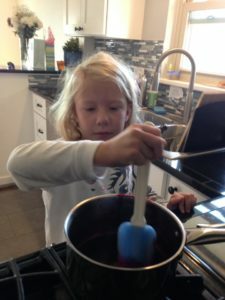 Foraging for food is a great way to engage kids in your outdoor adventure. The idea that you can find delicious, edible food in the wild captures just about every kid’s imagination. You, of course, need to be careful and know exactly what you’re searching for, but when you do it’s a lot of fun for kids and parents alike. We found a couple small huckleberry patches on the lower part of the trail but they had very little fruit. After hiking and searching a little more, we came upon a sub-alpine marsh that we found a huge swath of ripe huckleberries. Before we knew it, 45 minutes had flown by while carefully collecting the small purple fruits in a zip lock bag. My daughter was completely absorbed in the activity despite only walking away with half a sandwich-sized bag of berries after nearly an hour’s worth of work. We got back to the car nearly four hours after leaving it that morning without a hint of tears, crying or whining. My daughter loved every minute and as a result I loved every minute. 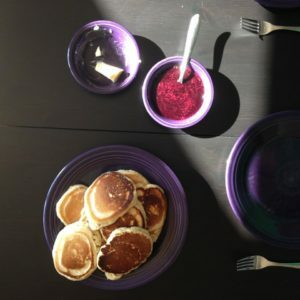 Pouring sweet huckleberry syrup that my daughter helped make on top of fresh pancakes that she helped mix and cook was a big moment to share as a family. I reminded her that the whole spread on the table was made possible by her work. I could see she was proud of herself. Even better, after devouring three big pancakes, my daughter patted her belly, smiled and said she wanted to go hiking again to get some more huckleberries. Maybe after just a couple more pancakes, kid. Looking for more ideas to keep your kids happy on the trail? Check out these Hiking Dadventure Kits that’ll make any family adventure easy. Previous Previous Are We Having Fun Yet?